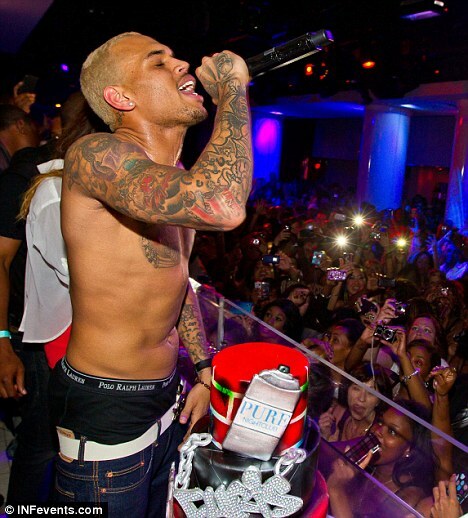 Chris Brown continued his comeback campaign in Atlanta last night, where he rocked Hot 107.9’s Birthday Bash. The star brought his trademark brand of electricity to the stage, lighting it up with performances of his biggest hits including ‘Look At Me Now’. In an interview with Sister 2 Sister magazine, Joyce Hawkins said: ‘He has to learn to deal with it and go on with his life. This is something that happened; it was a huge mistake… it was not good at all. ‘But he is still a human being and we all make mistakes and we live and we go on with it. But he has to own it, deal with it and move on with his life. Back in 2009. 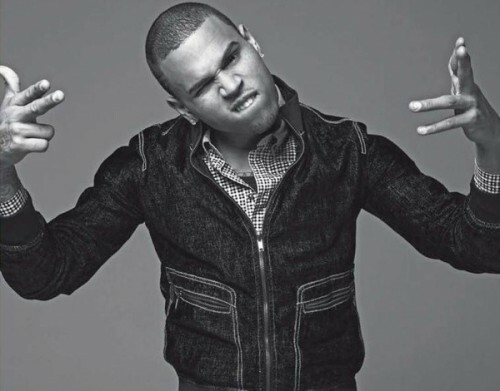 Brown pleaded guilty to felony assault after a bust up with his then-girlfriend Rihanna on the morning of the Grammy Awards. 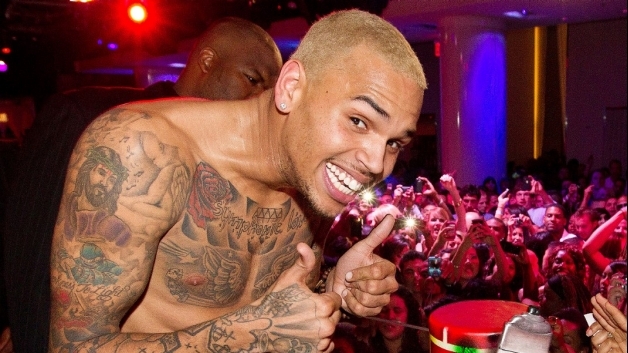 It looked like Chris Brown didn’t have a care in the world as he stripped off in Las Vegas to celebrate his 22nd birthday. Sporting a heavily tattooed torso, the singer smiled widely as he posed with a brightly coloured birthday cake at trendy nightclub Pure yesterday. However, as he celebrated in front of a crowd of party goers, his mother’s comments about his infamous Rihanna assault were hitting the headlines. 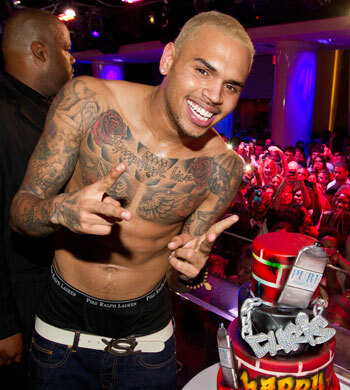 Below are images are pictures of Chris’s Birthday Cake Respesenting his Latest Album F.A.M.E which is In Stores Now!!! 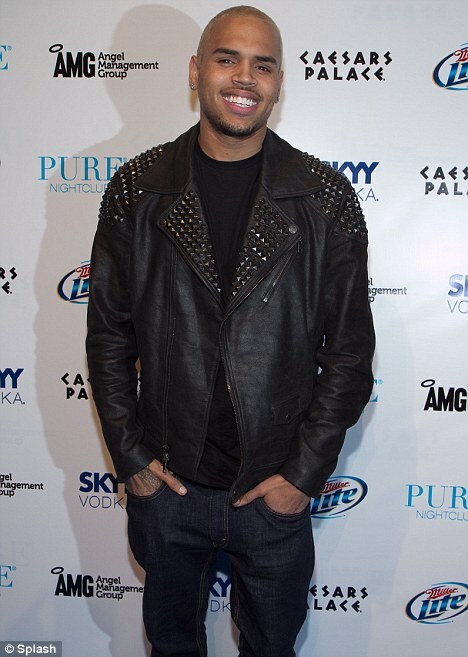 Brown’s outburst after appearing on Good Morning America put the F.A.M.E. singer back in the hot seat, with the public wondering if he’s made any progress on dealing with his anger issues. According to our friends over at Popeater, Brown will be a part of the Today show’s Summer Concert Series, taking to the stage July 15th. Rihanna will kick things off May 27th, and expect to see performances throughout the summer season by Cee Lo Green, Bruno Mars and Lenny Kravitz. Kravitz will close out the series on September 2nd.